C.H. 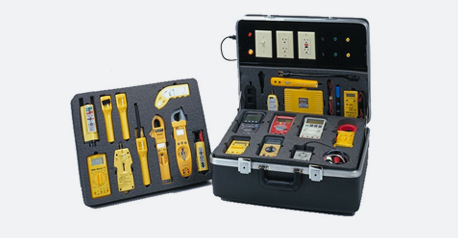 Ellis recognizes that choosing the right plastic case is an important first step. That is why we offer a variety of manufacturing processes, including Thermal Formed (Vacuum) Cases, Rotational Molded Cases, Injection Molded Cases, and Blow Molded Cases. Each of these processes present its own particular set of benifits and disadvantages. Thermal forming of cases is a process where a sheet of plastic is heated, pulled into a vacuum box, formed and cooled. CH Ellis carries a wide range of mold sizes to meet your thermal formed needs. The advantages of thermal forming are that it is relatively quick, sheet thicknesses can be varied, a variety of sizes are in stock, and per piece costs are very reasonable. If a mold is required, there is usually an 8-10 week window, but costs are lower than injection molding. Rotational molding of cases is a process where plastic pellets (shot) are fed into a mold that is rotated, usually on 2 axes, forcing the pellets into and throughout the mold cavity as the mold is in an oven. To ensure an even flow of plastic, the mold is in continuous motion during the heating and cooling cycle. At the end of the process, which can take an hour, the case is removed from the mold and a new shot is started. 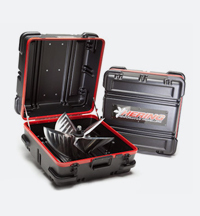 The advantages of rotational molding are that you get a very rugged case. Such cases are used for shipping or for military requirements. C.H. Ellis has a wide range of sizes to meet your rotational molded needs. Blow molding is a process where a plastic is heated and then extruded through a die into a hollow tube called a prison. A mold closes around the parison and it is inflated forcing the plastic to the sides of the mold where it is cooled and extracted. 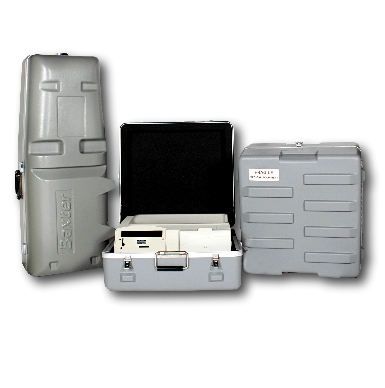 The advantage of a blow molded case is that it is very cost effective, and there are many sizes from which to choose. We stock more than 60 sizes. 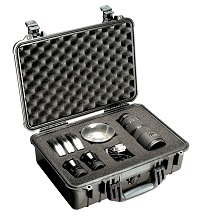 We can customize a case by using a variety of foams such as flocked foam for a clean aesthetically pleasing finish. Or, we can insert a thermal insert into which you can snap your items to secure them. Injection Molding Is a process whereby powdered plastic is fed from a hopper into an injection molding machine that consists of a steel barrel containing a rotating screw in the hollow center of the barrel. The screw carries the plastic along the barrel to the mold where heaters melt the plastic as it travels. Then, the screw is forced back as the melted plastic collects at the end of the barrel. When there is adequate plastic collected, an hydraulic ram moves the screw forward through a sprue into a mold cavity. During this process, the mold is kept warm to ensure the plastic remains in a liquid form and doesn’t mild before the mold is full of the required plastic. In the next stage, pressure is maintained to prevent the material from creeping back during the hardening (setting) period. This time is called the “dwell time.” This prevents the plastic from shrinking to ensure a better quality product. The mold cools, and the plastic form is ejected from the mold which is in the form of the mold cavity. The time to produce parts varies based on what is being produced and whether or not it is a single vs. multi-cavity mold. Injection Molding is useful when you require large quantities of repeatable product (1000+ per year). It is not the choice to make long shapes or bottles. The mold costs can vary from $2,000 to $100,000 depending on the complexity required. While we do not do our own injection molding, some of our partners are leaders in the field such as Pelican and Maxado..